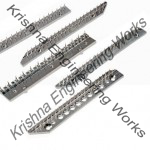 Krishna engineering works is a company engaged in manufacturing, exporting & supplying Web Aligner unit, Hydro-Pneumo Web Aligner, Web Guiding System, Tracking Rollers, Spare Parts of Web Aligner Unit, Repairs & Servicing of Web Aligner Unit and many more. Copyrights © 2019 chainlinkbottomparts.com. All Rights Reserved.